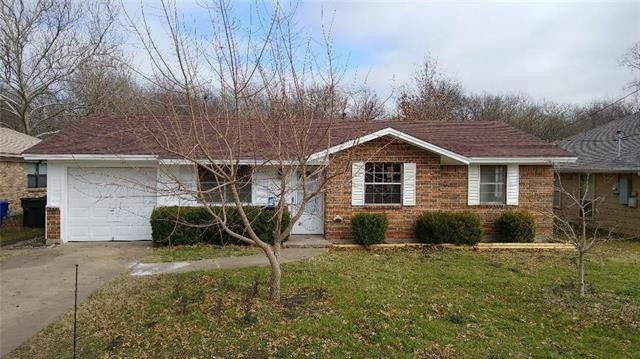 Great brick starter home location on this 3br, 1ba brick home with HUGE back yard framed with 6ft privacy wood fence that allows a treetop view of the green belt. Watch mother nature not your neighbor ! Home recently updated with new paint and laminate flooring throughout. New stove, vent hood, sink, disposal, doors interior and exterior, new roof including decking, deep insulation throughout attic including over garage for better utilities. Home offers custom cedar wainscoting in dining area for a rustic accent inside and a large covered patio to enjoy the large backyard. Mature neighborhood and no thru traffic on this part of Patricia Dr. Directions: From Hwy 11 aka Dewey Ave in Sherman turn on E Wells Ave next to Crutchfield Elem. Turn left on Patricia, property is on the right.